When, in 1951, Henri Dutilleux presented his vibrantly diatonic First Symphony, Boulez greeted him by turning his back. 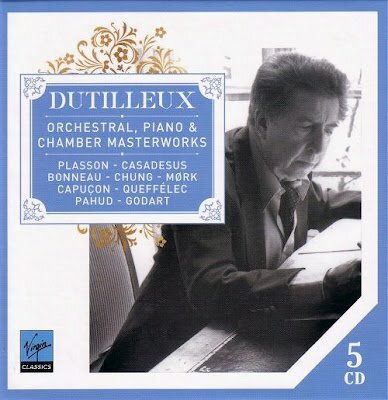 That is Alex Ross writing in The Rest is Noise and Dutilleux's vibrantly diatonic Symphony is one of the works in a new five CD overview of his music. There is much notable music in the oeuvre of this underrated composer, and also a sub-text that is relevant to the challenges currently facing classical music. Dutilleux (b. 1916) reflects his fascination with time and memory in his compositions, and uses involuntary memory to link past, present and future. His music is certainly not retrogressive. But its message is that, despite Boulez, we cannot turn our backs on the past; a very relevant sentiment as classical music struggles with denying the past and reinventing itself as a child of the digital age. Virgin Classics' Dutilleux box also includes his Second Symphony, the Cello Concerto composed for Mstislav Rostropovich, the Violin Concerto commissioned by Isaac Stern, and a stunning performance by the Belcea Quartet of Ainsi la Nuit - the latter work obviates back turning as its influences include Webern's Six Bagatelles and Berg’s Lyric Suite, as well as Gregorian chant. I paid just £18.99 for the set at classical independent Prelude Records; yes, it is cheaper elsewhere but I am happy to spend my money in a store where al-Kindī-style good vibrations mean music buying is still a pleasure. Dutilleux is one of several French composers who are worth a detour: others include André Jolivet, who was a friend of Dutilleux, and Maurice Ohama. Thanks for the heads up! This looks like the kind of titanic bargain we should all be snapping up before the record companies realise they can't go on selling it so cheap and the ship of recorded classical music slips beneath the waves for good. Andrew, yes, Virgin Classics is, of course, part of beleaguered EMI. This is another interesting example of the disc and MP3 formats being almost the same price - £14 versus £12.75 in the UK. MP3 format versions have historically been cheaper because of manufacturing/distribution costs, but that seems to be changing. There's an interesting comment from Dutilleux on Boulez in a 2005 Guardian interview, "Our relations are now very good, très chaleureux," says Dutilleux. "At the moment I have no problems with him. I even like the fact that he is no longer certain, but is a man riven by doubt, as we all should be." Another French composer worthy of a detour is Henri Tomasi. I am working on his Trombone Concerto right now, and I am really loving his fluid, lyrical lines and 20th century-expressionist harmonies. There is also Eugene Bozza, who wrote some of the most difficult and imaginative brass chamber music of the 20th century. I can only agree enthusiastically with celebrating Ohana, Jolivet and particularly Dutilleux, but let me add to Bodie's suggestion of Bozza, for he was much more than a composer of exceptional wind music. His large catalogue remains to be explored, and I have heard a Symphony of his from 1948 that is mightily impressive and suggests Bozza was capable of something much deeper than we know from his wind works.